Well everyone I've figured out the specialty coffee I'm bringing!!! Of course, if you want to bring some of your own, I won't hold it against you. I'm still trying to figure out a name FOR the coffee..but I'll have something by the Gathering. I also have one more tea to craft, it doesn't have a name yet either XD. I bet you're dying to know what comes next though, aren't you? Well Saturday (23 June 2018) we're going to have a field trip to the Smokey Mountain National Park. We'll have to carpool (Convoy anyone?! Maybe I should bring some signs that say "Convoy" on them for the car in the front and one in the rear XD, I always wanted to steal one of those signs from the Army...I'll need to create a couple I suppose....or...not... lol). The trip will be the majority of the day, and our close out for the day is going to be so exciting. I can't wait to tell you about THAT one, but I can't just yet. So let's just begin with the next release- what we're doing that morning after breakfast. We're going to put my degree to some use, and I'll be teaching a class on Search and Rescue. Most people will expect that such a class is meant to teach you how to actually be a member of a SAR team. However this class aims to teach you about awareness, preparedness and team work. With some luck, I will be accompanied by a co-instructor that has quite a few years of experience in the field as a SAR leader. During the second half, we are going to have a practical exercise, where you will be asked to go on a short search of your own. Because I want to run one team at a time, the exercise won't be long. So don't worry about having to walk long distances. It'll be fun, and a great learning experience. 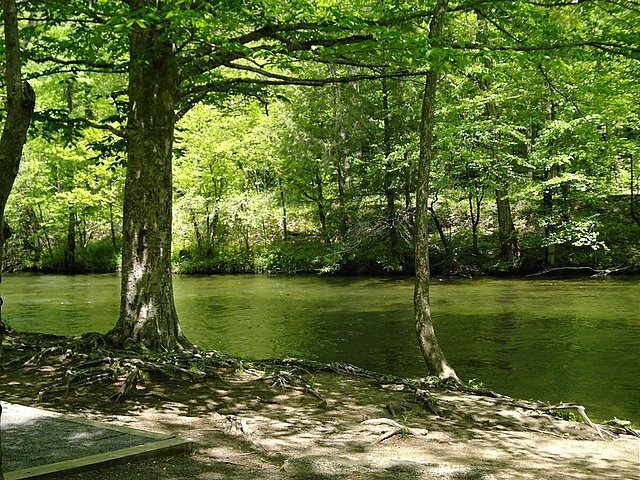 We will leave Metcalf Bottoms at 5 PM for the cabins where preparation for an awesome ceremony and dinner will begin. I'll tell you about that later though. For now, let's just keep you in suspense and just say- as much as I love the workshops I'll be personally running, no workshop excites me about this gathering more than THIS ceremony. So, we have been offered 2 scholarships to the Jedi Gathering. One of our supporters is offering to pay for two people to attend the Jedi Gathering, but only their fee to the gathering ($150), getting there will have to be on you. Still getting that initial payment up can be difficult, and we hope that two of you who really want to attend but can’t figure out how to pay the $150 will take advantage of this opportunity. These are due by 1 May 2018. Nice of them to help out in such a way. Having to go in order of our itinerary has been HARD! But I finally get to tell you my favorite event of this whole gathering. For years Gabriel Calderon has been a leader in the Jedi Community, and runs the oldest offline order Chicago Jedi. As a family member of this community, it's only natural for many of us to want to join him in one of his greatest joys- marriage. Gabe and I have worked for years to create ceremonies for our Jedi Mystic program. And of all the things we've created, the ceremony that gains the most influence from Star Wars is the wedding we crafted. Inspired by Luke and MaraJade's wedding in the fiction (thank you Kitsu Tails for pointing us in the right direction!!! ^^), we hope that you'll be excited to join Gabriel and J Rolla Calderon as they share the first Jedi Wedding Ceremony ever performed in this tradition. We will have a variety of cold drinks (including bottled water) available for every meal. If any of my attendee notices something in here they are allergic to, or think there might be an ingredient they are allergic to- LET ME KNOW so I can switch it out. Navigation Cafe while we are greeting people coming in and talking Force Realist Philosophy with one another (navigating our beliefs and learning as we go, “Navigation”, get it? Okay, I thought it was clever… XD), we will be enjoying Nightsister Tea and a selection of finger desserts. Your choice of Gabe’s Shamanic Journey or Ally’s Inner City Meditation. Breakfast: Grits, Biscuits & Turkey Sausage Gravy, Scrambled Eggs w/ cheese (unless someone that can cook a prettier egg than me wants to help out, then we can have some over-easy and/or fried…I just can’t do pretty eggs XD). If you’re still hungry, there will be an assortment of pastries, instant oatmeal, cereal and yogurts left over. Dinner: Antebellum Inspired dinner with Collard Green stuffed Turkey Breast, Mashed Potatoes (REAL mashed potatoes, none of that instant non-sense XD) and Peas with Pearl Onions. After Dinner Dessert & Jedi Sextant: The Navigation Cafe opens once again, this time to play our rounds of the Jedi Sextant and enjoy the discovery of our thought processes once more! This time, however, we will be having Capriole Tea and a selection of finger desserts. Breakfast: Assorted of pastries, instant oatmeal, cereal, yogurts, and eggs & sausage/bacon for anyone that wants to cook their own. Field Trip Departure for the Sinks in the Great Smokey Mountain National Park. Snack Time: since we’re having a slightly later dinner, and we had an earlier lunch. Snacks will include things like pretzels, small cookie packages and drinks. Dinner: Shabu-Shabu. It’s a Japanese communal dish, look it up. It’s really awesome :D. Hope you guys can use chopsticks!!! It’s just not the same without them!!! After Dinner Dessert: Finally we have the Celebration Cafe. This cafe opens in honor of both our wedded couple, and your journey here at the Jedi Gathering. Featuring a tea called “The Shaman’s Love” and a specialty coffee “Apple of His Eye”, served alongside Japanese-inspired parfaits. During this time, have fun with the people you have met this weekend, talk about things you learned, sign each other’s commemorative journals you got at the beginning of the gathering. Knighting Ceremony for anyone that passed the Knighting Reviews. I can't believe it! Tomorrow I set out for East TN, to attend and host the largest Jedi Gathering to date!!! We booked the whole place, and have a couple of attendees staying off site. I'm looking at 36 attendants! THIRTY-SIX! Thanks for the update and happy trails to you and your event.